Tiny Maile Pearl made Senate history Thursday without making a sound. WASHINGTON (AP) — Tiny Maile Pearl made Senate history Thursday without making a sound. 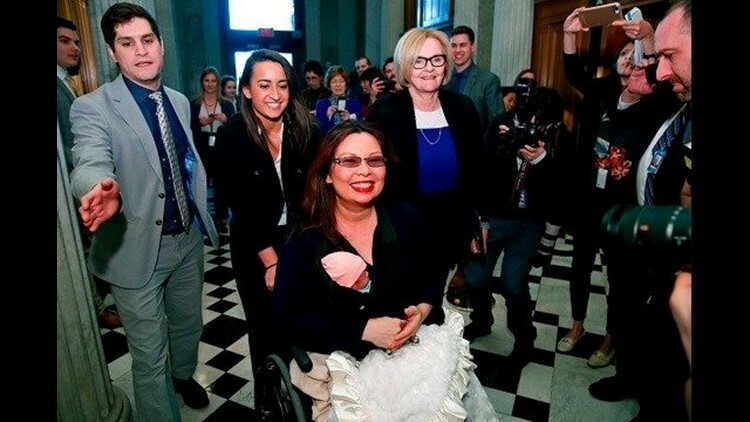 The tightly wrapped 10-day-old baby, brought to the well of the chamber by her mother, Sen. Tammy Duckworth, became the first newborn to appear there just one day after the Senate approved a new rule permitting it. "It's about time," the Illinois Democrat and Iraq War veteran told reporters on the way in to vote. The rule had passed without objection — but there had been plenty of grumbling about babies threatening the Senate's cherished decorum. But when it actually happened, even stern Senate Majority Leader Mitch McConnell appeared to beam. In fact, he left a Senate vote open to allow Duckworth time to get there. "Thank you very much," Duckworth said to the Kentucky Republican. The double amputee, in a wheelchair with Maile, pronounced MAY-lee, in her lap, was on the floor for less than three minutes before they took off. "May have to vote today. Maile's outfit is prepped," she tweeted, with a photo of baby clothes. "Made sure she has a jacket so she doesn't violate the Senate floor dress code requiring blazers. Not sure what the policy is on duckling onesies but I think we're ready." The idea was for Duckworth to vote only if she was needed to break a tie. Vice President Mike Pence arrived for the same reason. In the end, it was unnecessary and Bridenstine was confirmed. Duckworth cast a thumbs-down anyway, before her colleagues descended to coo over the wee baby. Senate Democratic leader Chuck Schumer inquired about the well-being of Maile's sister and wished them a safe trip home. When Duckworth wheeled around to leave, reporters in the press gallery above got their first glimpse of the baby's face, and a loud "aww" could be heard. The senators on the floor laughed, and Schumer called up to the gallery: "The press is finally interested in something worthwhile." Senators of both parties had been interested, too, for the past two months. But many of their concerns revolved around whether babies would disrupt "decorum," the relatively civil style of discourse practiced in the Senate over the nation's business. Even a day earlier, they were fairly open about that. "I'm not going to object to anything like that, not in this day and age," said Sen. Pat Roberts, R-Kan., father of three and grandfather of six. He then noted that a person could stand in the door of the cloakroom, a lounge just off the chamber, and vote. "I've done it," he said. Allowing babies on the Senate floor, he said, "I don't think is necessary." Sen. Orrin Hatch, the father of six, grandfather of 14 and great-grandfather of 23, said he had "no problem" with such a rules change, but he hoped the parents of newborns would use "discretion" in bringing them. "What if there are 10 babies on the floor of the Senate?" he wondered. On Thursday, there was only Maile, wearing a little pink cap and getting all the attention without a sound. Sen. Amy Klobuchar, D-Minn., who had done some of the negotiating and behind-the-scenes reassuring of senators, clapped and gave Duckworth a hug when she arrived. With a big smile, Duckworth cast her "no" vote.